Just a few weeks before the end of World War One, a British decoy ship attacked and sank a submarine off England's north-east coast. The only trouble was, it was British not German. It would be decades before relatives learned the truth of what happened to J6. 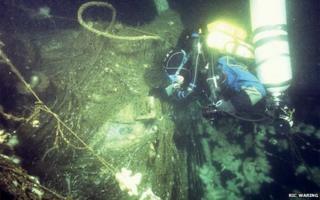 "We dived in expecting it to be a First World War cargo ship," says Gateshead diver Steven Slater. "To our surprise, we got down there and it was a big submarine on the sea bed." This was the first time since October 1918 that anyone knew exactly where the J6 was. "One of our guys actually spotted the telegraph lying on the top of the conning tower," he says. "It had English writing on, which was the first major surprise because we didn't know of any English submarines that were unaccounted for off our coast." The next clue was the vessel's size. The length of a typical cargo ship, it was "huge", he says. At 80m (260ft), the J class was half as long again as previous British submarines. The new shape allowed it to keep up with the surface fleet it worked alongside. Nearly a century since J6 went down, it was becoming clear to Mr Slater he and his fellow divers had found a grave. In the last weeks of World War One, the British Q ship Cymric had been patrolling the Northumberland coast. It was one of a number of decoy vessels designed to look like merchant ships to entice enemy submarines to come to the surface. With hidden weapons, it was ready to attack if they did. Spotting a submarine in the fog off Beadnell, the Cymric opened fire. Witnesses at the subsequent court of inquiry said something had been hanging over the letter J on the submarine's conning tower, making it seem like a U. The British submarine looked fatally like a German U boat. Maritime historian Dr Robb Robinson says no-one seems to have spotted the ensign. "In the damage that ensued, by all accounts, the submarine became uncontrollable," he says. "Because it continued to move they were absolutely convinced that they were right, that this U-boat, as they thought it was, was trying to get away, and they continued to bombard it." By the time they realised their mistake, J6 was sinking and many of her crew were dead. Only 15 out of the 34 on board survived. "People who were in the engine room, the artificers and the likes, they just didn't get out," Dr Robinson says. Athol Walton is pleased his widowed grandmother never knew what happened. "They did a muster call and couldn't find eight people," Mr Walton explains. "To keep the submarine afloat for as long as they could, so they could get off, they sealed hatches. "There's a quote [in the court of inquiry transcripts] that says the fate of the engine room staff was sealed once they closed those hatches, because they couldn't get out once the ship went down." What was a Q ship? The incident was classified and relatives simply informed there had been a collision. Although, as Mr Walton points out, the survivors would possibly have told a different story. The court of inquiry absolved the Cymric's captain of all blame. Pauline Eismark's grandfather, 22-year-old Philip Tachon, went down with the submarine. "My grandmother never mentioned it," she says. "Well they didn't, did they? "She lost two brothers and a husband and her brother-in-law in the first world war. She'd already lost her father when she was seven in a mine accident, so she was pretty hardened." Mrs Eismark had finally been allowed access to the official documents and, hearing J6 had been found, contacted the divers. They offered to go back, map the wreck and lay a wreath. "My dad died a few years ago so he never knew where his father was," Mrs Eismark says. A stoker, he is more than likely still in the engine room.